Dry eyes are a common discomfort - reading, stress, contact lens wear, and staring at the screen all day can dry out your eyes. We all want our eyes to feel better, but many dry eye sufferers are concerned about the chemicals found in eye drops. Traditional over-the-counter drops use chemicals to mask symptoms. Similasan of Switzerland works differently, by using natural botanical extracts to stimulate the body's natural defenses and target the root cause. Similasan products are made without harsh chemicals, so you can use them as often as needed. Q: How often should I use the eye drops? A: The recommended dose is 2-3 drops per eye as needed. 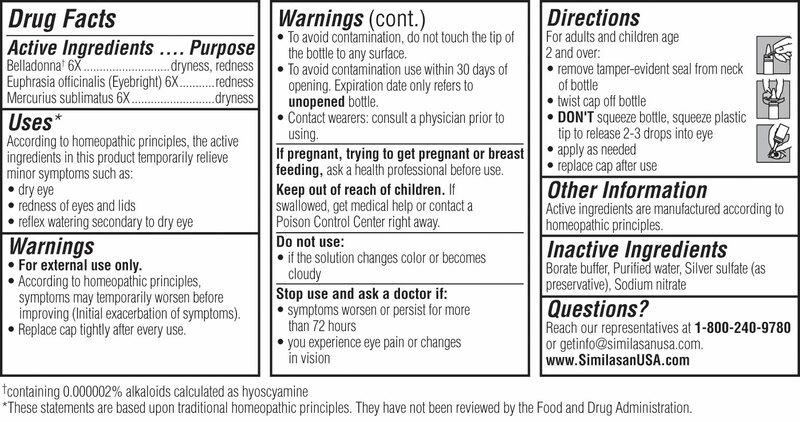 If your symptoms do not clear up after the first 2-3 drops, then it is okay to add more drops until symptoms diminish. Similasan eye drops can then be used as many times per day as needed. Q: Do you have a preservative free eye drop? A: Yes, you can find the single-use droppers of Similasan Allergy Eye Relief and Dry Eye Relief at Whole Foods or your local health food store. Q: Can I still use the product after 30 days? A: SImilasan eye drops use a mild preservative that guarantees the product will be free of contaminants for 30 days after opening. If the product has not been contaminated, you may continue to use it until the bottle is finished. Q: Can I use Similasan eye drops with my contacts? A: Similasan has formally tested its eye drops for compatibility with contacts. Because of the natural active ingredients there is nothing in the product that will damage the lens. The drops will not harm your contact lenses, however if you have allergies or redness, it is best to avoid lenses for a while until symptoms subside. Allergens and irritants can become trapped under lenses and prevent the drops from working as well as they should.